Here is the easiest way to put LimoWiz data on a new server. Copy the entire limowiz2000 folder from older server to new server, normally to C: drive. You can use a USB drive to move the folder. *Share* the limowiz2000 folder on server and give Full Control permission. 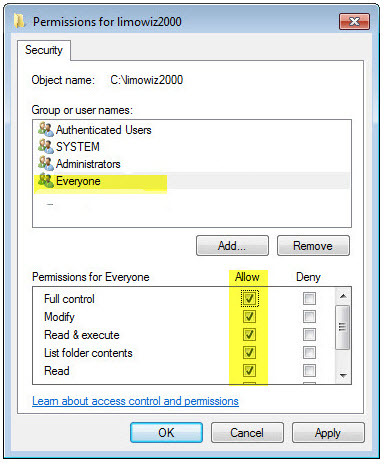 Security permissions must also be set to “Full Control” to “Everyone” user. If you do not Everyone user, click the Add button (as shown below). 5. Open LimoWiz and make sure LimoWiz has all your data. If it says it is a trial, it means you did not move the data correctly. Go back to step #1. 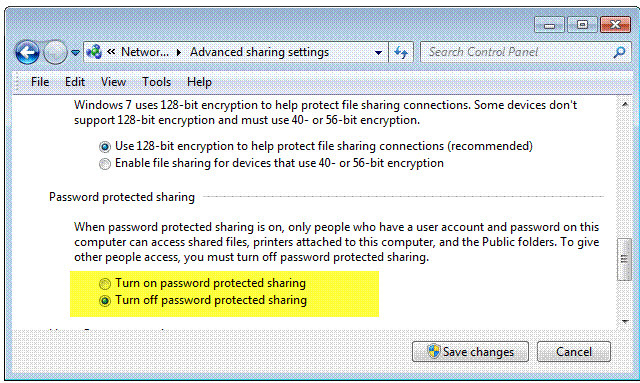 Note: “Turn off password protected sharing” in the advanced sharing settings. Install workstation setup on all workstations. Make sure server and workstation have the same LimoWiz version number. Turn off old server so that LimoWiz will not see old server; this will force workstations to prompt you for the new LimoWiz data path. Change the data path on all workstations to new shared limowiz2000 path on new server. NOTE: make sure you download and install the REQUIRED DOWNLOADS from members page on server and workstations. If you want change the old server to a workstation, you must uninstall LimoWiz from old server, then delete the limowiz2000 from the drive where it is installed, then install LimoWiz workstation. Do not delete anything from old server until LimoWiz is working correctly on new server and it has all its data. Note: exclude the limowiz2000 from anti-virus scanning to prevent interference with LimoWiz data files and slow downs.